New Jersey, Plaintiff In Sports Betting Case Before The U.S. Supreme Court, Will Start Taking Bets Sports betting has gone back and forth in court for a decade in New Jersey, the state central in the case before the U.S. Supreme Court last month. This week the governor signed a bill legalizing it. 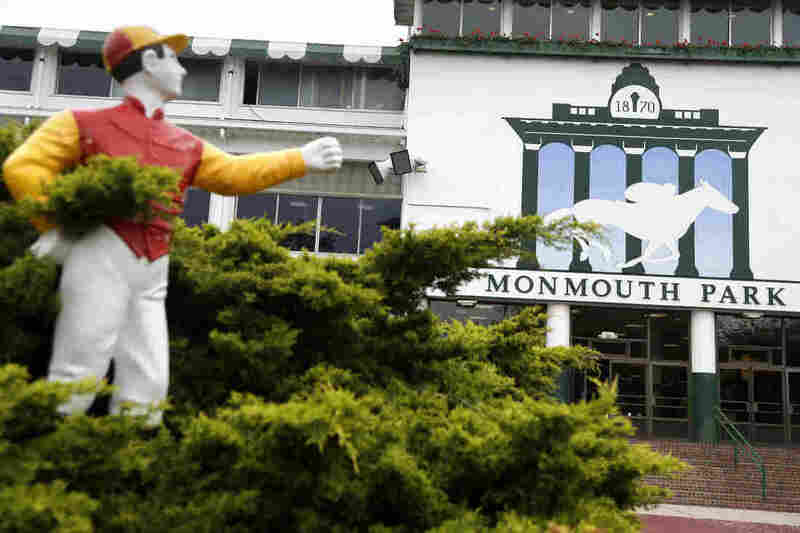 Now that New Jersey can allow sports betting, Monmouth Park in Oceanport has set up a sportsbook operation and plans to start taking bets later this week. New Jersey is about to cash in on sports betting. After a protracted legal battle and millions spent in court costs, the state will be able to accept legal wagers on sporting events, thanks to an opinion last month from the U.S. Supreme Court that overturned a federal ban on sports wagering. The atmosphere has public officials and gambling houses alike feeling like they just hit the jackpot. "I'm happy with this," says Dennis Drazin, who runs the Monmouth Park racetrack in Oceanport, N.J. "We're going to make money. We're going to save racing. The state's going to make money. This is a win-win for everybody." The New Jersey Thoroughbred Horsemen's Association, which Drazin oversees, was a plaintiff on some of the lawsuits against the major sports leagues and the NCAA, which fought for years to keep the federal ban on sports betting in place. Early in the battle over sports betting, Drazin says he realized that the track could not subsist on race earnings alone. It would need another source of revenue. "Sports betting means survival for Monmouth Park," he says. Now Monmouth Park, in partnership with the sports wagering company William Hill, is preparing to open the doors of its newly developed sportsbook and grandstand later this week. The racetrack is not the only venue set to take advantage of legalized sports betting. Several casinos in the gambling resort town of Atlantic City have announced that they too will offer a place to wager on athletics. Rummy Pandit, executive director of the Lloyd D. Levenson Institute of Gaming Hospitality & Tourism at Stockton University, says sports betting could help struggling Atlantic City reshape its image for a younger crowd as it tries to diversify its reputation. "There is a whole new market that will be coming to New Jersey now, and they'll be coming not just for sports betting," Pandit says. "They'll be coming for the experience. We are gaming. We are entertainment. We are hospitality. We are food and beverage. All of the above. And we have a beach." One of the biggest financial winners of the court decision may be the state of New Jersey itself. Under a bill passed by the state Legislature last week, New Jersey would tax in-person wagering at 8.5 percent. Online bets would be taxed at 13 percent. In recent legislative testimony, state Treasurer Elizabeth Muoio predicted that New Jersey would earn about $13 million from sports betting in its first year. Other observers said that was a conservative calculation. The American Gaming Association estimates that people in the U.S. illegally wager $150 billion on sports annually. But the legalization of sports betting nationally has not come without its hiccups in New Jersey. The four major professional sports leagues — baseball, basketball, football and hockey — and the NCAA still greet legalized sports betting with skepticism. At first, the leagues asked New Jersey lawmakers to levy an "integrity fee" on each bet, money the leagues said would help to police illegal wagering and game-fixing. The Legislature declined. The leagues also asked state legislators to require casinos and racetracks to share data and information on betting patterns. "If casinos see the brother of a player come into a casino 10 minutes before a game, place a large bet on his brother to perform poorly in the game, and make comments about how the fix is in, the casinos have no obligation under this law to contact us directly and let us know," said Bryan Seeley, a representative of Major League Baseball, in legislative testimony. Still, none of the wrinkles in the last few weeks of ironing out the details of sports betting in New Jersey seem to have overcome the euphoria many officials say they feel at having the legal blessing to offer wagers on athletics. In 2007, Rudy Garcia, the former mayor of Union City, went to place a bet with his bookie and instead became entangled in an FBI sting. He was arrested and charged, though the charges were later dropped. His friend and law partner, Ray Lesniak, heard what happened and says he found the whole ordeal unfair. "I got very concerned that he was arrested for doing something here in New Jersey that he could've gotten on a plane and [done] in Las Vegas." A state senator at the time of Garcia's arrest, Lesniak decided to do something about what he calls an injustice. He successfully pushed for an amendment to the New Jersey Constitution that allowed the state to pass a law legalizing sports betting. Then, Lesniak and the administration of then-Gov. Chris Christie went to court against the four major sports leagues and the NCAA, which filed lawsuits aiming to uphold the federal ban on sports betting. The ensuing legal battles lasted years but ended in May, when the U.S. Supreme Court overturned the federal Professional and Amateur Sports Protection Act of 1992, calling it unconstitutional. Although states had a chance to legalize sports betting before the passage of PASPA, only four did. New Jersey was not one. "All along, no one gave me a chance," Lesniak says, about his years-long fight to overturn the federal ban. "All these great legal minds [said,] 'Lesniak has no idea what he's talking about. There's no way this is going to happen.' That's why I feel just a little bit of self-satisfaction." Gov. Phil Murphy signed the sports betting legislation into law Monday.